The arcade version runs on the Dreamcast-based NAOMI 2 arcade hardware. 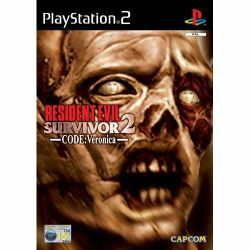 The PlayStation 2 version of Gun Survivor 2 was released in Japan and the PAL region (the latter renamed Resident Evil Survivor 2 Code: Veronica). The Arcade version of the game uses a fixed machine gun that serves as a joystick to move the player and rotate the view, as well as to fire the player's weapons. The game runs on a timer that counts down when an area is entered, and if time runs out, the Nemesis from Resident Evil 3: Nemesis will start pursuing the player and attack them. Only certain arcade machines have 2 player support. Gun Survivor 2 has no bearing on the plot of Code: Veronica and the events of the game are actually depicted as a dream in Claire's mind at the end of the game. This page was last edited on 17 May 2010, at 18:32. This page has been accessed 7,434 times.